As an introduction to I.E.M., let me quote directly from Steve Wilson's own homepage, as it explains it best really. "This project developed out of Steven's interest in experimental music from the seventies. The music is not intended to have any kind of faux seventies feel, but does nevertheless draw inspiration from aspects of this music. Some might legitimately view the project as simply being a more abstract and indulgent version of Porcupine Tree." Whether indulgent or not I won't speculate, but being particularly fond of 70's Krautrock, I found it every bit (or perhaps more) desirable than the genuine Porcupine Tree material. The spirit is the same as the old German masters, some of the hypnotic tendencies are the same, but it is dressed up in a more modern way affording it the necessary freshness. The first four tracks originally appeared on the 1996 LP version, with the 1998 track "Headphone Dust" added as the CD bonus and upping the total time to about 45 minutes. 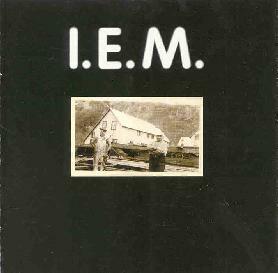 It's no secret that Mr. Wilson is a little crazy about the music of Neu!, and both "The Gospel According to I.E.M." and "Deafman" defer heavily to that style. "Deafman" is prime proto-trance music...it's got all the facets: the choppy guitar riffing, the bass counter-rhythm, the deliberate Dinger-esque drumming, the backmasked bits, and even the "cha-cha" vocal chanting. "Fie Kesh" is cool, cosmic and has a subtle Eastern flavor with its quiet drone and tabla percussion hiding behind the streams of guitar and steady bass. The finale "Headphone Dust" is a real winner, and could easily fit right into any Porcupine Tree album (or "Wish You Were Here" for that matter) - cosmic slide/gliss guitar and atmospheric synths, you know the drill. The musicianship, as always, is top-notch. I'm a little uncertain though if anyone else helped on the album (for such a thick booklet there's scant information). The drumming is quite good and I'd suspect PT's Chris Maitland may have offered his services for the sessions, though Steve Wilson usually does these projects alone. If so, he plays a mean set of drums in addition to all of his other talents. You really can't miss with this item - pretty much anything Wilson touches has turned to gold so far, and this one will receive heavy rotation at my homebase. So let's hope it doesn't take so long for the newest 12" EP "An Escalator to Christmas" (or even PT's LP-only "Metanoia") to get the digital treatment. Not all of us are vinyl aficionados, you know. Steve...are you listening? For more information on I.E.M. and other Steven Wilson projects you can visit his web site.